Moonrise is a 1975 Cal 34 that is perfect for sailing and adventuring in the Puget Sound and the Salish Sea. Over the years that we’ve owned her, we have fine-tuned her interior to make her perfect for 2-3 adults, or for a couple with 2 children. After owning the boat for a few years, we decided that we’d had enough of the large, cumbersome and heavy table that took up most of the cabin space. The table made it almost impossible to use the settee to its full potential as a lounging area. Mike and I like to have a place that is comfortable to lay around and read or nap in the cabin and the table began to be our nemesis. Because of its size it made access to the settee very difficult. We decided to change that. To replace the table we really wanted one of those cool Island Packet tables that double as a bookcase/liquor cabinet. Unfortunately we’d have to buy an Island Packet to get one. No can do. So our woodworker friend, Larry Simonds, built us a bookcase/table that would mount on the bulkhead. We use it for lots of things besides books, and we really like it. It folds up easily, making the cabin much more open and spacious, and the settee is so easy to access now. The table doubles as an extra work space for the galley. On a boat, most things have to do at least double duty. The table is also a useful work area for the galley. We love it. The striped cushion above the settee is a cushion we use in the cockpit. It is easily stored above the settee and makes a good head rest as well. The settee is very comfortable with its new dense foam and pillows. I can lie there and read all day long. And the table works great. It’s one of the best things we’ve done for the boat. Mike put electrical outlets on the bulkhead below the table so we have a place to plug in our computers. He has built cabinetry to hide the electrical in that area. He’s getting to be very skilled! I like to sit there to write posts. In the photo you can see a flat bungee cord. It is a simple way to keep the table in place when it is folded. There is also a hole in the side where you can use a pin to keep it in place. We find the bungee actually is quieter while under way. Teak battens made great covers for the electrical cable running up to the mast. There is a lot of storage underneath the cushions. Removing the bulky table also allows us to access those spaces more easily. Next time we’ll look at the galley. Stay tuned for Part 2. 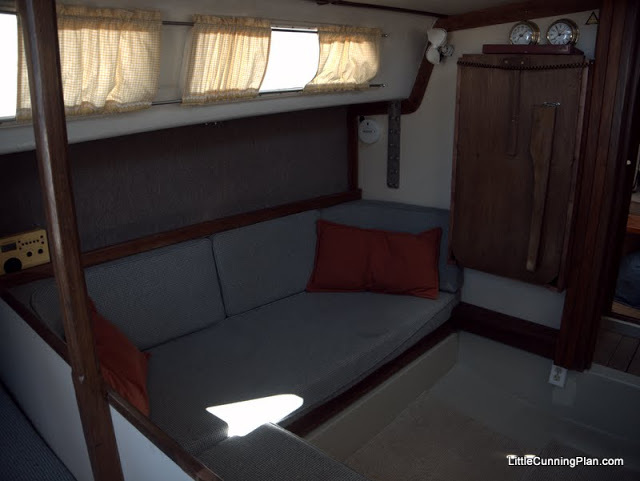 This entry was posted in Sailboats and tagged boat interiors, boats, Sailing, Tiny House by Melissa. Bookmark the permalink. Hey! Love your site! You sound like we did a year ago going through all the elements of the best blue water boat for us. After spending way too much time on craigslist/yachtworld for about a year, we noticed that prices kept falling on boats we were interested in, anmiri by now might be the best time to buy in terms of market prices. Just a thought, and good luck on your search! Oops! I meant “and right now might be the best time to buy.” Darn that iPhone typing! Hi there! Thanks so much for stopping by. We’re still so new to the blogging world that when we get new people (like those who are not friends and family) stopping by the blog, it’s really exciting. You are so right about the timing in terms of market price right now. But we’d have to sell Moonrise before buying anything else. We just have to come to terms with the idea of not having a boat for awhile. Yikes! It fills me with dread. I think I would feel completely landlocked. I might panic for a minute. But probably we won’t find that perfect boat until we have room for it in our lives and our wallets. I admit we’ve been spending too much time on Craigslist and Yachtworld. I’m working on a post about that. Hi Patty, and welcome to the site! Our base was built of fiberglass just as you say. We used a cutting tool from Harbor Freight to cut through the fiberglass and the really thick plywood underneath. Then we mixed epoxy and filled the void until it was level with the surrounding floor. Our ‘smoothing’ job wasn’t as good as a pro could do, but it was good enough and we have two area rugs that match the floor that covers that area anyhow. I had paint mixed at Lowe’s to match the color of the fiberglass and painted the patch. It looks pretty good, and I really love having that toe-stubber out of the way. If you have any other questions, don’t hesitate to contact us. It was one of the things we have done to the boat that really improved the liveability of that cabin.